The New Testament was originally written in Greek, and it apparently did not occur to the writers that a visualization of the many (and lengthy) Biblical genealogies would be helpful. They knew a lot about geometry but nothing about infographics. Given the importance of the New Testament genealogies for the foundation of Christianity (see The role of biblical genealogies in phylogenetics), it is not at all surprising that eventually someone had a go at summarizing them all in one place. However, this did not happen until several centuries later, when the Bible was being translated into Latin. Perhaps this delay had something to do with the biblical prohibition on images. 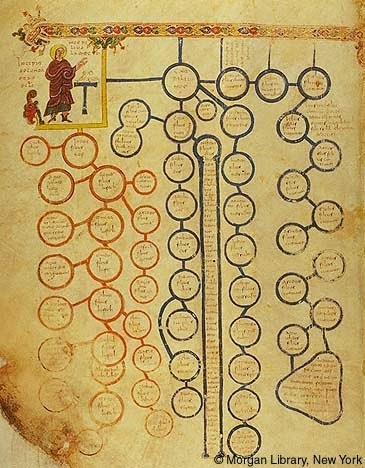 The first known attempt to draw a biblical pedigree, rather than writing out the relationships as text, also appears to have been the first attempt at a genealogy of any sort. Jean-Baptiste Piggin has been researching this document since 2009, and he has remarkably extensive notes about it at his web site Macro-Typography. Piggin dates the document to sometime in the decades before 427 AD, which is surprisingly early and thus unique in its historical context (Late Antiquity). Importantly, the pedigree is actually an infographic in the modern sense, in that the figure itself conveys almost all of the information, with the text acting as a supplement. Thus, a single image allows the viewer to grasp the overview (of biblical history in this case), as well as providing access to the details. This is an idea that did not really catch on until the Medieval period, when Latin manuscripts started to use images as pedagogic devices, in addition to their textual descriptions. 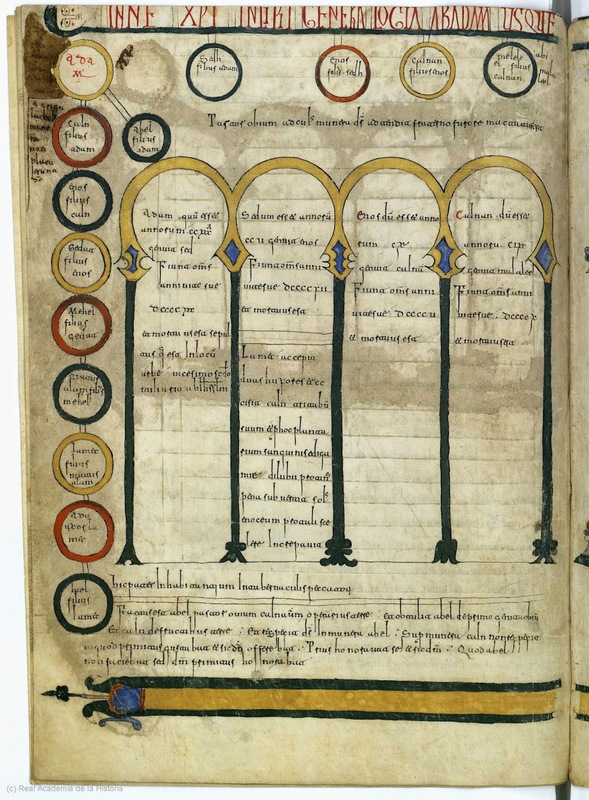 An obvious example is the so-called Tree of Porphyry in logic, which was first described in words by Porphyry of Tyre in c. 270 AD (Isagoge), sketched by Boëthius c. 520 AD (In Porphyrium Commentariorum), and finally reproduced as an actual tree diagram in Medieval manuscripts (being named arbor Porphyrii by Petrus Hispanus in 1240, in Summulae Logicales). Sadly, there is no extant copy of this early biblical pedigree, and so we do not know who produced it or exactly when; nor do we have any of the copies made during the following 500 years. We do, however, have 24 complete or partial copies from the period 950-1250, many of them incorporated into Spanish editions of the Bible. Piggin has studied these copies extensively, and tried to reconstruct what he thinks the original document most probably looked like. Piggin reconstructs the document (shown above), which he calls the Great Stemma, as a single scroll made from papyrus, designed to be unrolled and read from the upper left towards the middle right. 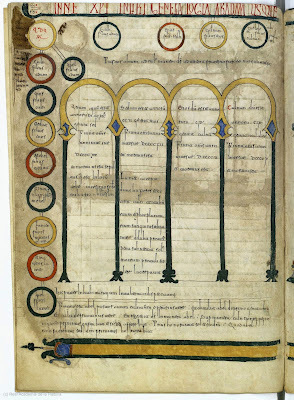 All extant copies, however, break the figure up into sections, for inclusion as pages in a parchment manuscript (a codex) typical of the Medieval period. Reconstruction was not an easy task, given the later modifications, digressions and embellishments, made with each successive hand-drawn copy. In particular, the process of reducing the long scroll to sequential pages apparently introduced many errors; and subsequent modifications degraded the logic of the original intention. Incidentally, embellishments do not improve the communication of information (see Mistaken improvements), and nor necessarily do modifications, since in this case they often created contradictions. Above is a schematic overview of the reconstructed original scroll, but you can zoom in to all of the details by visiting Piggin's original reconstruction. Each circle represents one person (out of 540), with connecting lines showing their genealogical relationships — marriage, parent-offspring or brotherly (these are inter-mixed). Time is read left to right along the top (Adam is at the top-left), with vertical excursions downwards for lineages that do not lead to Jesus (who is at the middle-right). Note that the pedigree is drawn using nodes and lines, as we still do, but it is not drawn anything like a tree (ie. a "family tree"). Indeed, it is actually a network, since two ancestral lineages converge on Jesus (via Joseph and Mary). The diagram also has a distinct timeline superimposed, shown as the elements without circles, which attempts to synchronize biblical events with contemporaneous secular history. So, Piggin notes that the Stemma it is "not just a genealogy, but a graphic version of the universal chronicles which attempted in antiquity to cross reference the histories of different civilizations to establish an overview of Middle Eastern and Graeco-Roman history." However, the timeline is not calibrated in any way (ie. time changes are not constant). Below, I have included pages from some of the extant manuscripts, to show their variety after more than 500 years of scribes making copies. The above figure is the first page from the Roda Codex, in the Real Academia de la Historia (Madrid) cod.78 (dated 990 AD). This is the start of the genealogy, with Adam at the top-left, and illustrating his family. The above figure is the third page from an unnamed manuscript in the Pierpont Morgan Library (New York) M.644 (dated 940-945 AD). This one shows Noah and his non-Semite descendants. 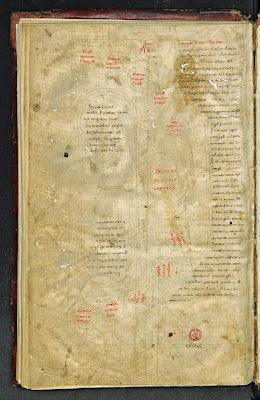 The above figure is the final page from an unnamed manuscript in the Plutei collection at the Biblioteca Medicea Laurenzian (Florence) Plut.20.54 (dated 1050 AD). 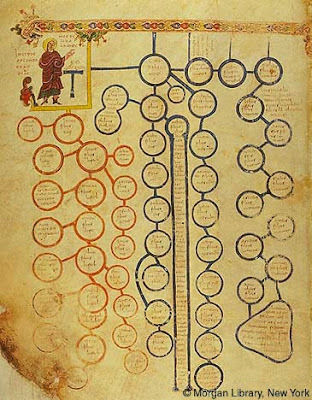 This shows the incarnation of Jesus, at the end of the genealogy, illustrating the confluence of the lineages described by Matthew (at the top) and Luke (at the bottom). Piggin notes that here may actually have been few early copies of the Stemma, because of the difficulty of transcribing illustrations by hand. That is, it is very difficult to accurately hand-copy a diagram, as opposed to copying text (where only the words matter not their visual style). Indeed, to what extent did the scribes actually understand that they needed a precise copy? Copying complex technical drawings requires careful measurement and layout, and yet some of the copies seem to have been very badly planned. Piggin suggests that "the serious corruption done to the Great Stemma early in its diffusion led to it ultimately being discarded and begun all over again by medieval writers such as Peter of Poitiers." The reference is to the Compendium Historiae in Genealogia Christi by Petrus Pictaviensis (Peter of Poitiers) produced in c.1185 AD, and for which there are many extant copies dated from that time to 1650 AD — he used long rolls for his genealogies. 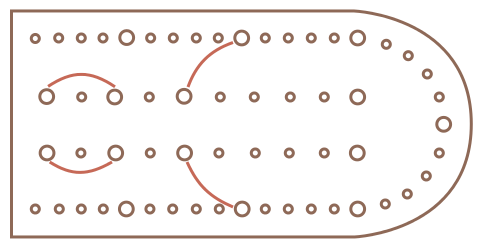 Finally, Piggin even has a suggestion for a small ancient board game that might have provided inspiration for the form of the infographic (see Board Game). This is important, because there are no known prior models for constructing such a diagram — apart from geometry, no-one had previously produced an image that illustrated non-corporeal ideas. Footnote: The word stemma referred originally to an ancient Roman genealogy (displayed in noble homes), which is roughly how it is used by Piggin. However, these days the word is more commonly used in anthropology to refer to a genealogy of manuscript copies. 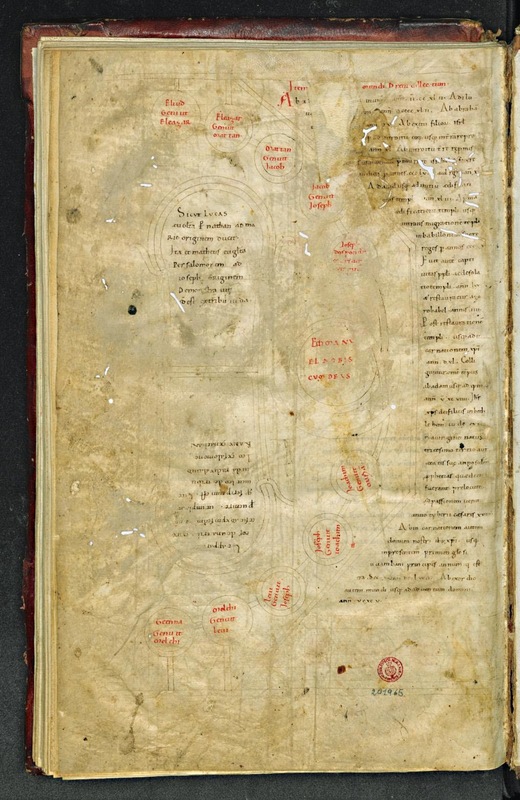 A genealogy of manuscripts is more properly called a stemma codicum.